With the hectic pace of life today, how do you maintain a healthy diet? That's a question many of us ask as we try to lose weight or eat healthier while life tugs us in a thousand directions. Truthfully it is an uphill battle, but it becomes easier with practice and the development of healthier habits. If you really want to maintain a healthy diet, you'll have to plan to do so. When you have a plan, and you're out running errands and run late you'll know what to do instead of pulling into the drive through of the nearest fast food joint. You'll be prepared. Have a healthy option on hand in your purse or stop at the grocery store to pick up a healthy option. Just because you have a plan, doesn't mean you have to follow a really strict eating regimen. Of course it will depend on what you hope to achieve, but usually when you follow a very strict eating plan that deprives you of most of your favorite foods, the day comes when you crash and burn under pressure and the next thing you know you're binging on every unhealthy food you can get your hands on. That is not what you want to do. One of the reasons obesity is such a problem today is that people eat way more calories than they need. Learning to eat moderately is one big step in maintaining a healthy diet. If you don't know where to start with this, you can check out the No S Diet. This diet works as an easy-to-follow guide to moderation, and yet doesn't deprive you of everything you love to eat. This healthy diet brings about slow, long-term weight loss and provides realistic dietary guidelines that are easy to follow even when you are on the run. If you were going to a health buffet, what would you pick up? How about some low cholesterol, normal blood sugar, normal triglycerides, and such things? If you stop and look at your food choices and ask yourself, "What will this do for my health?" It causes you to stop and think about the real consequences. 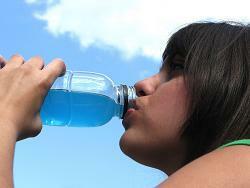 Beverages high in sugar including: Fruit juices and punches,soda, smoothies, sports drinks and sweetened coffee drinks. Vegetables - Incorporate 3 or more cups into your diet each day. Dairy: Cut your fat intake by switching to 1% or skim milk and do the same with your choice of yogurts and cheeses. Fat: Fat is a necessary part of a healthy diet. We don't need too much fat, but we do need the right kinds of fat. If you're looking for more guidance on this, Prevention Magazine's Flat Belly Diet helps you learn how to incorporate healthy fat into your diet and still lose weight. Healthy fats can be found in nuts, avocados, olives, nut butters and healthy oils such as canola and olive oil. The real answer to maintaining a healthy diet is to have a plan and to be prepared to follow that plan. Remember, it takes practice to develop healthier habits. Practice is repetitive. It becomes ingrained in us. If you practice unhealthy eating, that's what will come naturally to you, but if you gradually build new and healthy habits-they will become the natural thing to do. How do you maintain a healthy diet? It is a conscious choice one bite at a time, just keep your healthy options ready and it becomes easier.